!!!! ELECTION OF AICESTMOA, KOLKATA UNIT - 2018 !!!! !!! 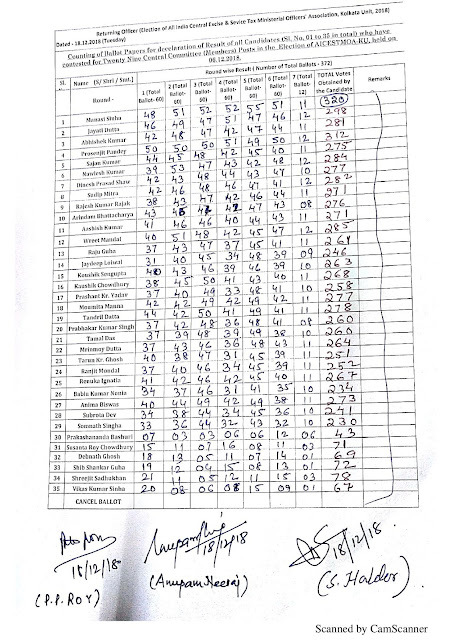 This is to inform you all that the RESULT OF Election of AICESTMOA-KU has been declared today !!! FOLLOW THE BLOG !!! . !!! We had a very fruitful meeting with the DGHRM in presence of three other officials of DGHRD office. Member (A) has assured that nothing negative steps would happen to this cadre. As he is new in the chair, he asked to give submissions on each issue like the type of self contained note, which our Association & Customs Association will submit jointly at the earliest. 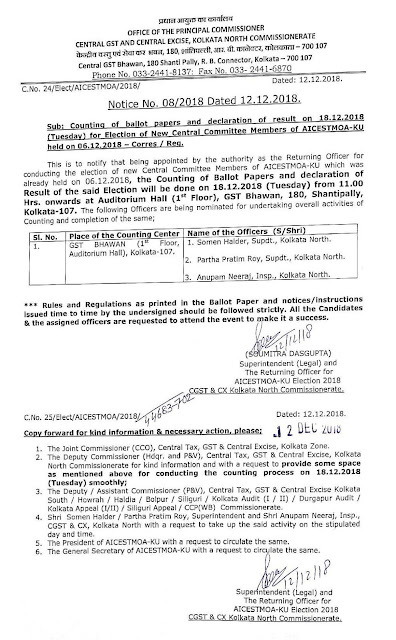 AO RRs file has returned to Board with some small query from DoPT again. File is pending with Member (A) Sir and will be sent back to DoPT very soon. 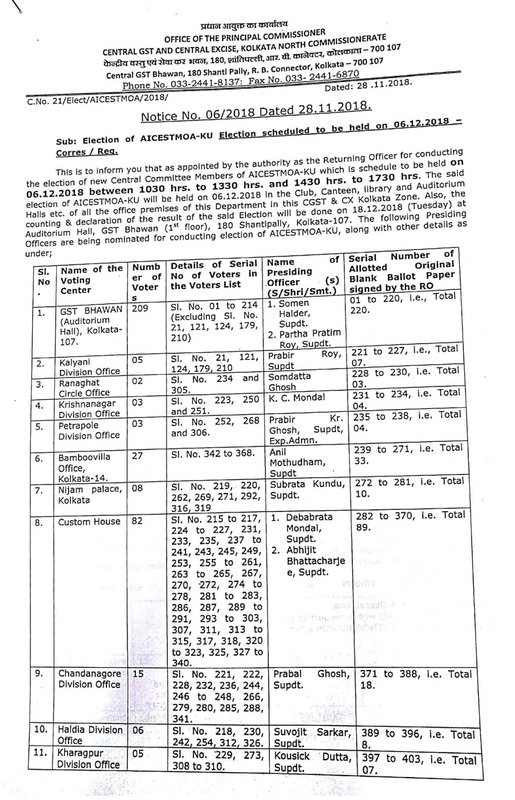 CAO promotion proposal is held up for the want of docs from CBN and Mumbai Zone (docs in respect of total three officers only. All of our National leaders are in touch to both sides; hope to solve it up soon. 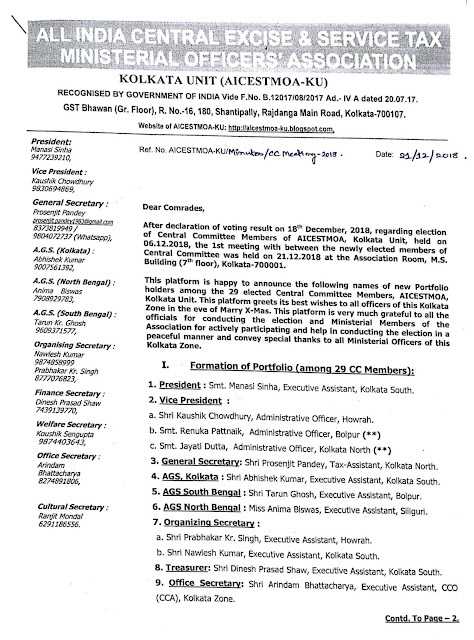 Relaxation issues of EA & Inspector, the data are sought from all field formations which are pending at present. 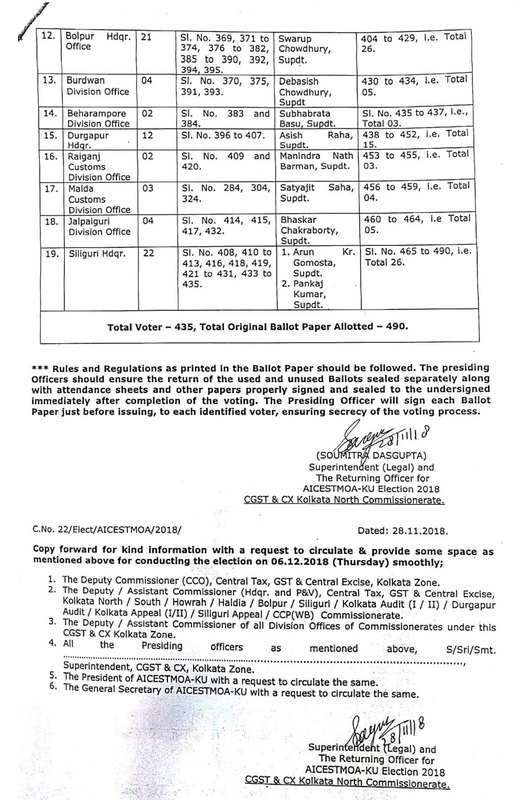 Amendment of RRs (EA and Inspector), Board has sought few justifications from the DGHRD for its further process. 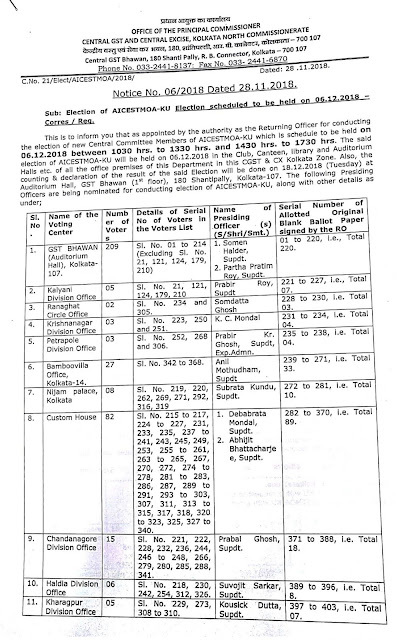 Amendment of TA RRs file has been sent back by the DoP&T to Board with some queries. 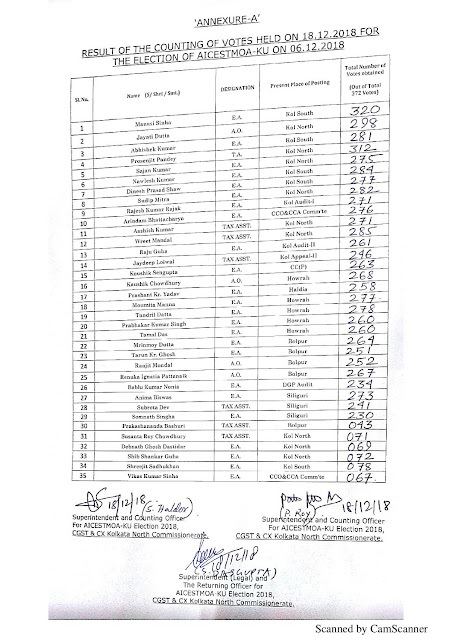 So, ICT in the grade of TA is very much operative as per the existing RRs of TA dated 10.01.2014. Other important issues, we will find out from other sections including Ad III A & III B of Board on tomorrow and will inform accordingly. We visited along with our National team and Customs SG at Hudco Visala (AD IIIA & ADIIIB Section) palace where all processes of Amendment of RRs & Relaxation files related to TA, EA and Inspector are being initiated. First we met DS AD.IIIA related to ICT clause in TA RR we put our strong disagreement with removal this clause and said that we will never accept this in any case. After a long discussion, he told that in that case before its issuance, it will be put in the Board's website for stake holder's comments. DoP&T has just returned the TA RRs file to Board with some queries. So it’s big news for all those friends who were seeking ICT as per TA RRs. Then we went to meet DS & US of AD IIIB where we discussed all the points regarding Relaxation and Amendment of RRs in the cadres of EA and Inspr and they directed us to submit our brief point wise proposals on it & also assured us that any amendment of RRs will be uploaded in the website for stake holders comments before its final publication / notification. We assured them that the OTR report as desired from all India field formations will be submitted by this month positively.. 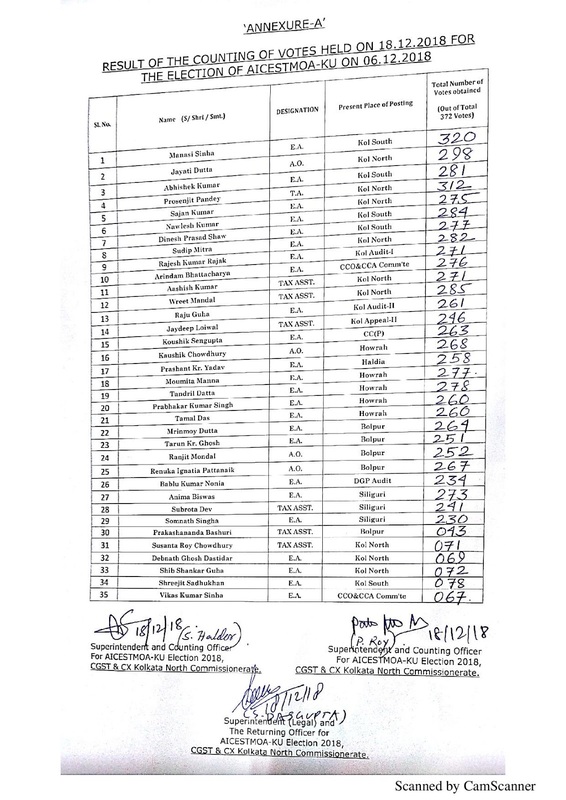 They told us that they will try their level best to give OTR this time in the grades of EA & Inspector, as ministerial cadres are the mostly affected at this juncture. We appreciated the positive intend of DS & US Sirs. One important thing to share with you that the Cadre Restricting may not come before 2020 or 2021. 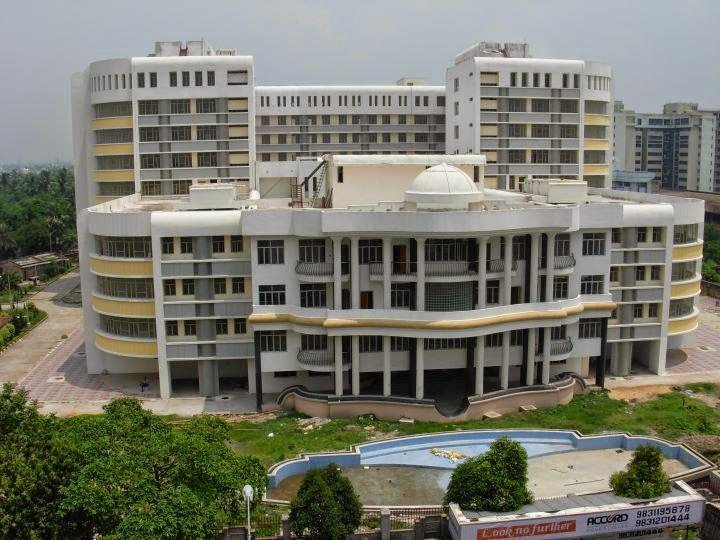 I really wish that what have been assured by all the Board Officials and DGHRD officers during our tour will be taken shortly and all of our major problems will be resolved soon in a positive mode. Hope for the best. One thing to share u all. 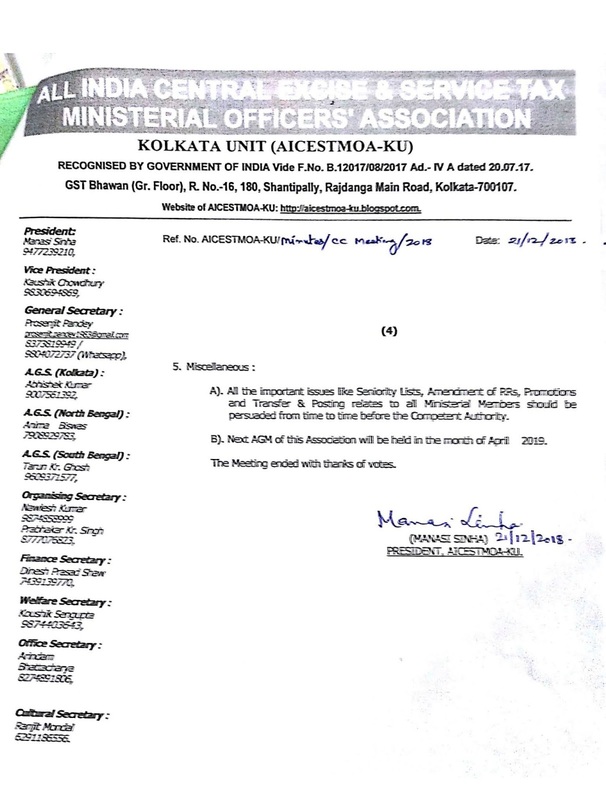 No harm will be occurred in respect of pension and all other pensionary benefits for the Ad-hoc officers who are retired or going to be retired. Board has assured on this front and is going to issue a clarification very soon. 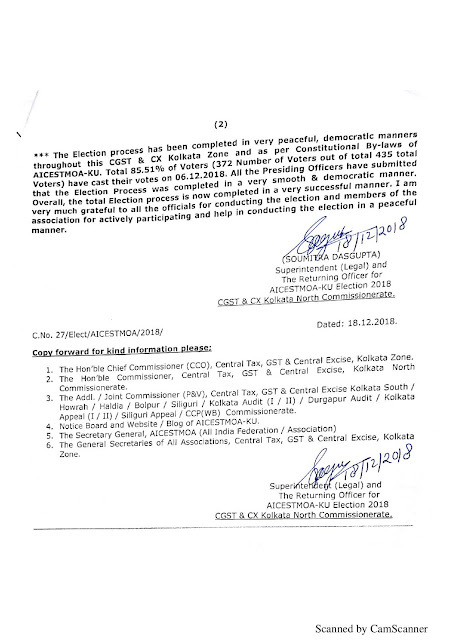 Letter dated 27.03.2019 sent to the Principal Chief Commissioner of Central Tax, GST & CX Kolkata Zone regarding discrepancies of Recruitment Rules of Executive Assistant (EA) notified on 28.09.2015 and the anomaly in reporting of vacancy in the grade of EA to SSC (CLICK HERE TO SEE THE LETTER). Declaration names of newly selected zonal office bearers of different zones of CGST&CX Kolkata Zone (CLICK HERE TO SEE THE NOTICE). 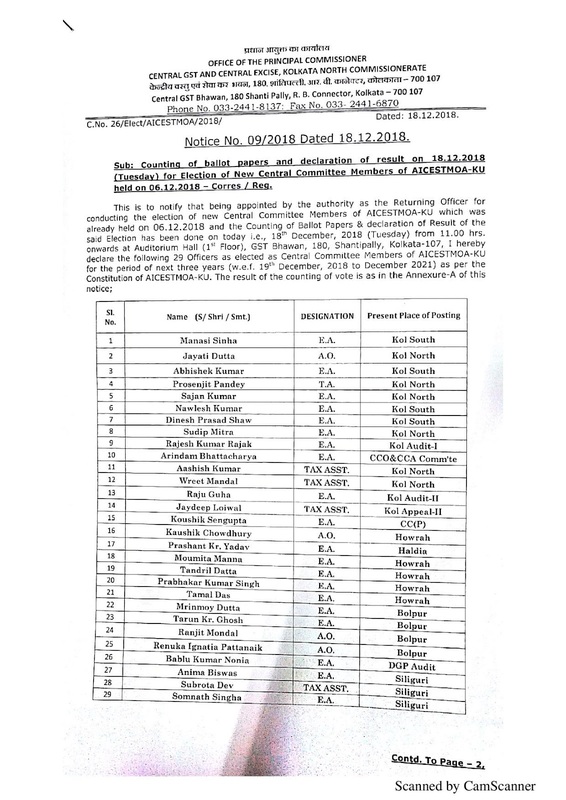 we Explicitly made him aware that nothing is left in ministerial Cadre and if ICT is also withdrawn then no one will even join this department as DR and requested him to at least add absorption clause in the Upcoming amendment RRs of TA as it is a Group C which is under the purview of Board itself. Later he sympathetically listened all things to us and in meeting of around 50 min. he assured that he will put positive notes but other stake holders are repeatedly going against us and saying that why uniformity is not their in ICT Cases but he said he will try his best definitely. then we thought of meeting with Deputy Secretary of Ad.III-B but after waiting for more than an hr. learnt that he won't return after lunch then we decided to meet him next day and then we went to North Block. 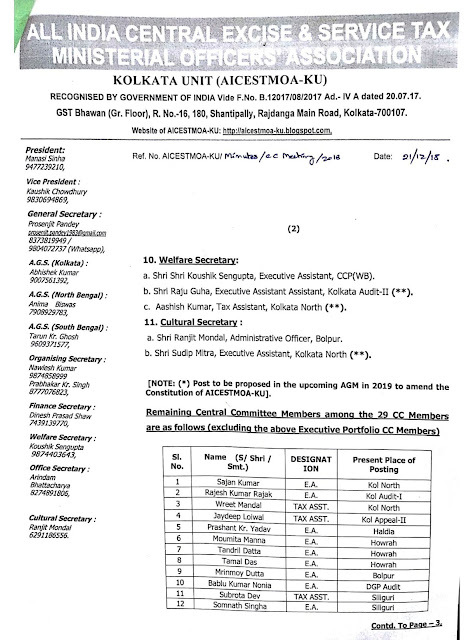 In North Block we went to AD.II-A Section first asked for the status of CAO promotion and ascertain the reason for the delay. 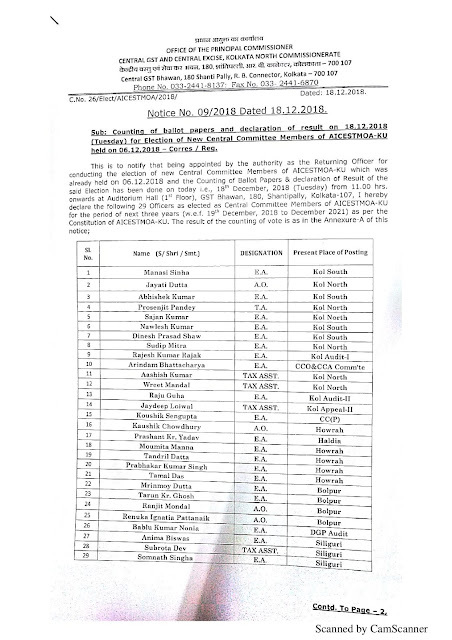 Got one list of 9 (out if which 3 have already received) retired officers whose documents are urgently required to send proposals to UPSC and we thought of personally follow for the same and called the concerned zones and CBN ( Narcotics). then we Went to meet Under Secretary of AD.I- A section. We asked about the update of RRs of AO and reason for the delay then the news came that RRs of AO is at Final Stage. 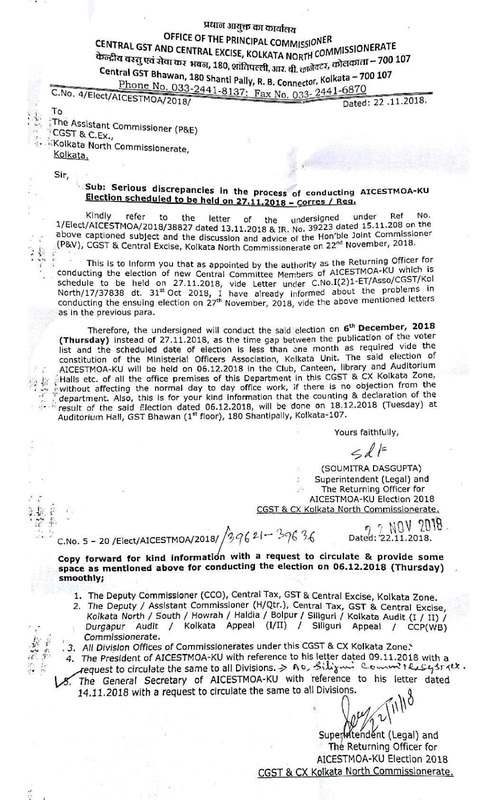 Recently DOPT had returned the proposal asked to rectify a few things and to add few clauses and send again which has been rectified as said and has been sent to DGHRD also and soon it will be sent to Dopt for it's finalization and approval and this time maximum chance is that it will be approved. 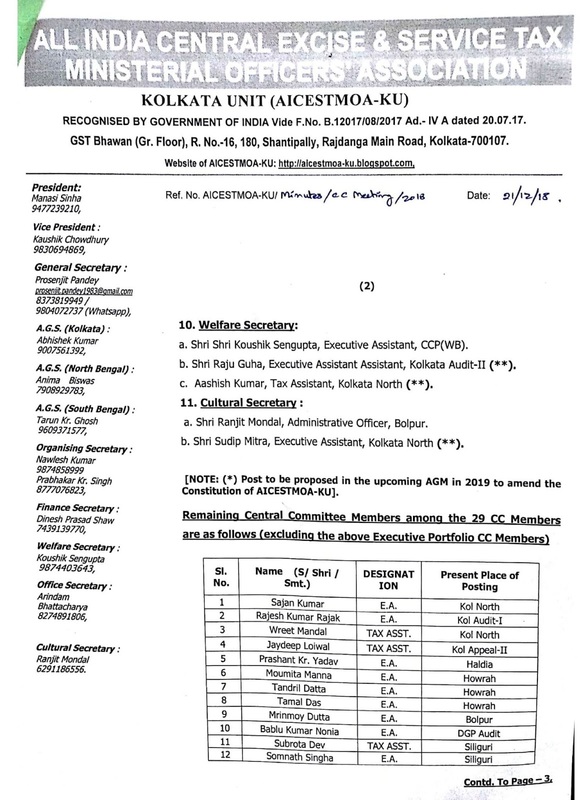 Then we met Director of AD.II and asked him that we will never accept any DR proposal in AO Cadre as the same for successive posts like TA, EA and AO and finalize it in 100 percent promotions as soon as possible plz by special watch as all the Annual DPCs are long pending since notification of EA RRs dated 28.09.2015. He assured that he will put up everything positively and send to DoP&T in favour of us before his retirement in the month of February. We started today with a strong intention to meet our new Deputy Secretary who has been replaced by earlier Deputy Secretary. We reached Hudco Vishala Palace first to meet him around 11 am where RRs and Recruitment are being dealt with. Luckily he was available and we discussed all the issues and problems related to our Cadre for a period over one hour to him like Amendment of Adverse RRs of TA, EA & Inspr...and reducing Eligibility service with enhancing the Promotional Ratio and to 3 yrs.+ 3 Yrs. For better promotional aspects for the betterment of Department for the betterment of Govt's minimum expenditure & maximum governance policy as well as smooth running of Administration and GST & Revenue related works. He was a really positive attitude person said that whatever proposal he will receive from DGHRD he will put up positively before the JS, Member (Admin) & the Chairman Sir and will send it to DOPT for approval. 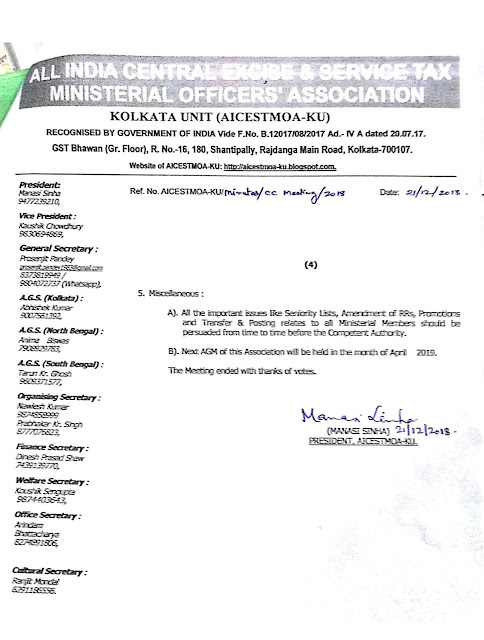 Then we also Discussed that all those who have completed their probation Period can be saved immediately before upcoming CR by Giving One Time Relaxation without any condition except completion of Probation Period and passing the Departmental Examinations by looking after the upcoming stagnation issues in TA grade and empty position of EA grade in very near future. 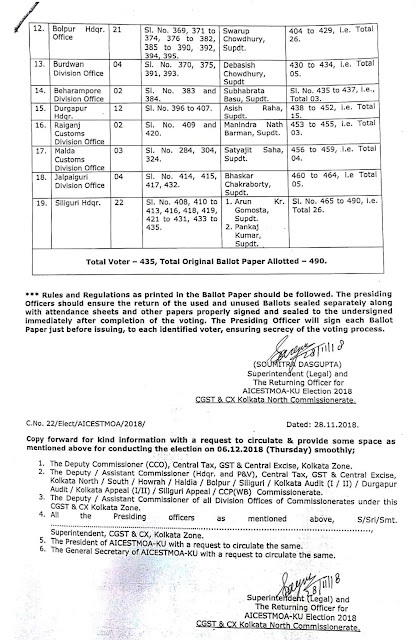 DS sir assured that he will put up the file related to this very soon and told us to submit a solid letter for OTR with all justifications and Regarding amendment of RRs of EA and Insp. too as it's a long run process, he also assured us that he will definitely forward the amendment of all RRs with positive note as far as possible. But he warned that if we take any such wrong step like Strike or any dharna or so then Member and New Chairman those who are at present seems to be positive and thinking to settle all issues of Ministerial Association may go against. So after a strong Assurance to settle our important issues. 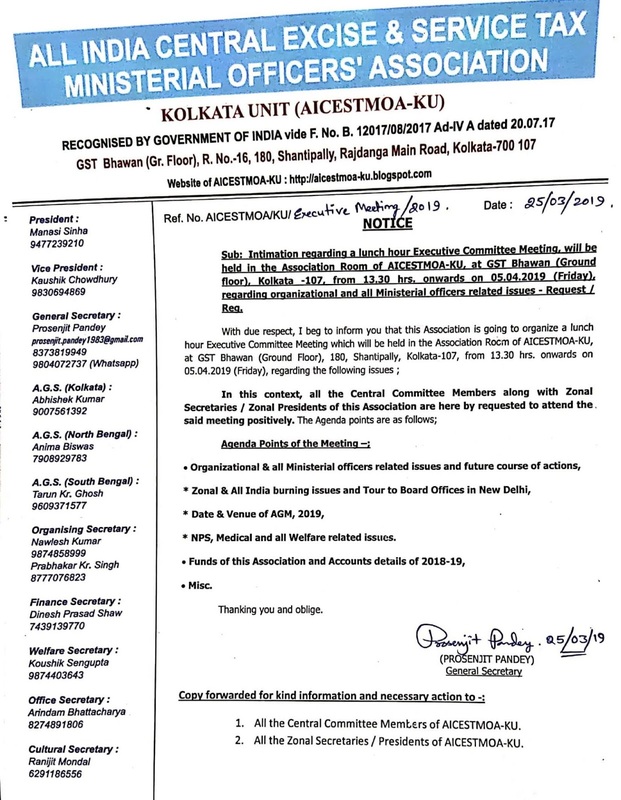 We thank him and left to DGHRD office at Gol Market, DGHRD Hqrs..
After reaching DGHRD office, we met AD, who was a Supdt of our Kolkata Zone incharge of all Recruitment Rules in DGHRD. He was a really gem of person and recently was promoted in the grade of AC & gets this charge. Before we came to the point he said that he has already sent proposal of 3+3 to Board which was rejected by DOPT earlier by asking for valid justifications. But he assured that he will send the same proposals again this time with all proper Justifications and will definitely look after all the RRs issues in favour of for it's amendment and uniformity with sister deptts. Said that points for amendment of AO RRs has also been sent to Board in the early period of this week with a very positive note for it's further onward transmission to Dopt. 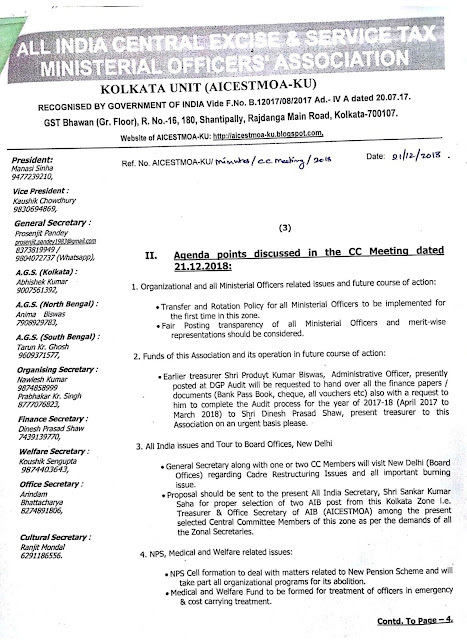 Their we met Officer in chair, madam regarding upcoming CR who is working for upcoming CR under Principal DG of HRD. Their we came to know that Cadre Restructure is still at draft stage, nothing is finalised yet may be notified under New government. Thus at the end we have come here for Executive committee meeting with all zones where few Decisions would be taken based on all these meetings. Overall it was one of the most ever successful meeting with a lot of officers at one go. Later SG and President of AIB who have come on today afternoon, met with the JS ( Admin) in the evening and briefed all the miserable conditions of all officers at this juncture Executive Meeting is going to start now. That's all for now. Hope for the best. CLICK HERE TO SEE THE AGENDA POINTS DISCUSSED IN THE CC MEETING HELD ON 08.02.2019. 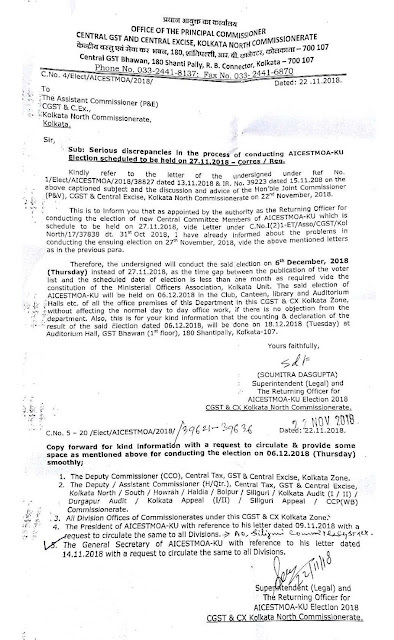 One letter has been issued to the Hon'ble Member (Admin), CBIC, New Delhi on 16.01.2019 regarding furnishing of agenda points (long pending important issues) of this Zone (CLICK HERE TO SEE THE LETTER). 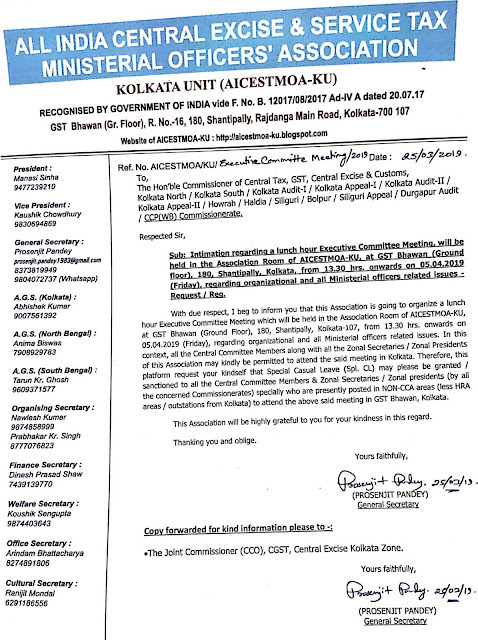 INTIMATION LETTER HAS BEEN SENT TO THE CHIEF COMMISSIONER OF CGST&CX KOLKATA ZONE, REGARDING FORMATION OF NEW PORTFOLIO AND CENTRAL COMMITTEE BODY OF AICESTMOA-KU (CLICK HERE TO SEE THE LETTER). Many many thanks to all our members. This is indeed a good news that election of AICESTMOA-KU was held on 06.12.2018 under this zone where all our members have voluntarily casted their valuable votes for formation of a new Central Committee. 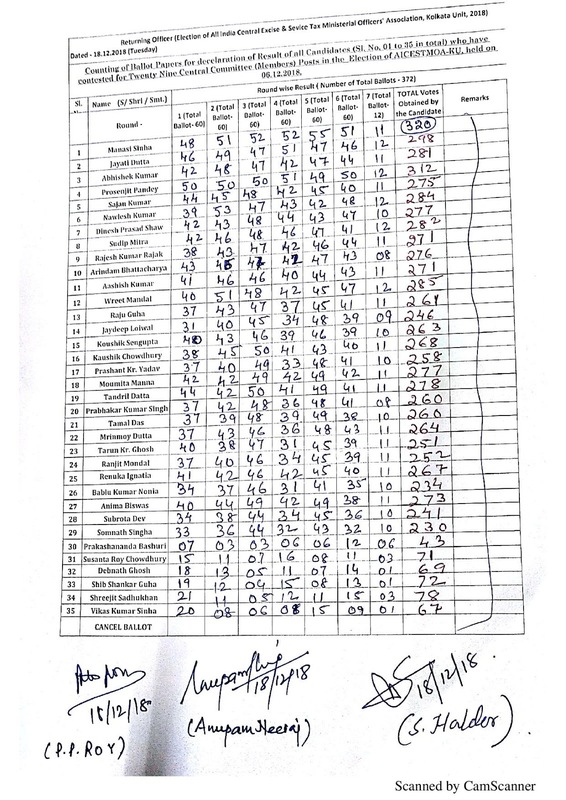 Today the result of counting of such votes have been counted at the Conference Hall of GST Bhawan, Shantipally, CGST & CX Kolkata Zone, Kolkata. The Result is posted below for information of all members. 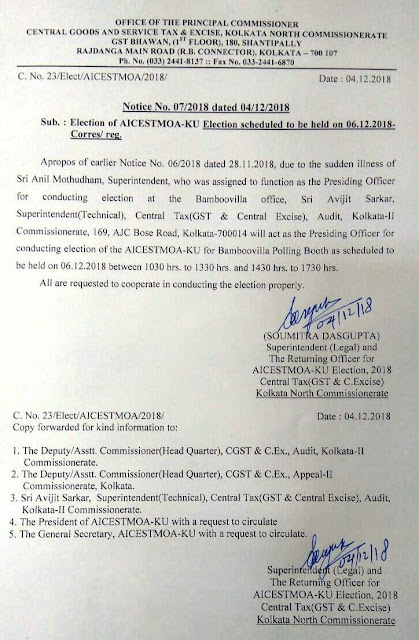 On completion of this successful Election of AICESTMOA-KU, all have been made possible with the support of the Authorities, Officers, Returning Officer, all Presiding Officers and also by the team works of all dedicated members of this association. Special thanks to all for their vital role in conducting and completing the election. 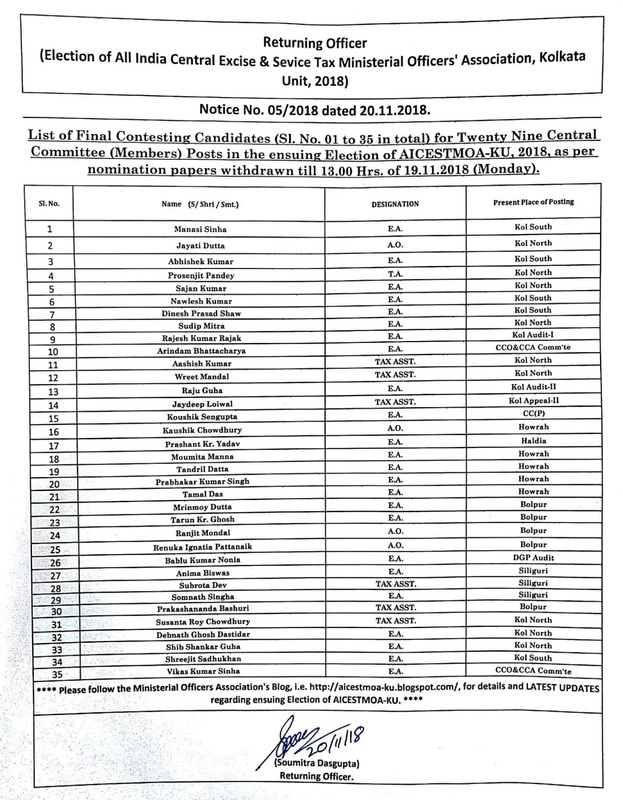 Good luck for next new Central Committee with the hope for best achievements for our members. 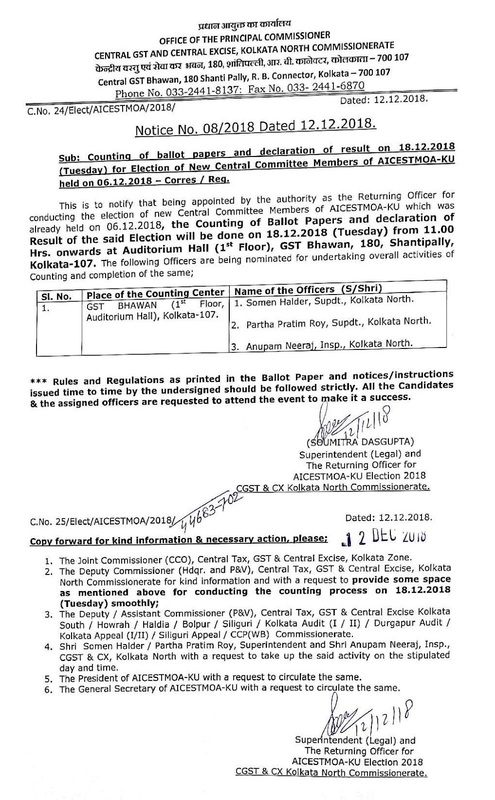 Notice for counting of ballots and declaration of result in respect of election of new CC Members of AICESTMOA-KU will be held on 18.12.2018 from 11.00 hrs. onwards at Auditorium Hall, GST Bhawan, Shantipally, Kolkata. 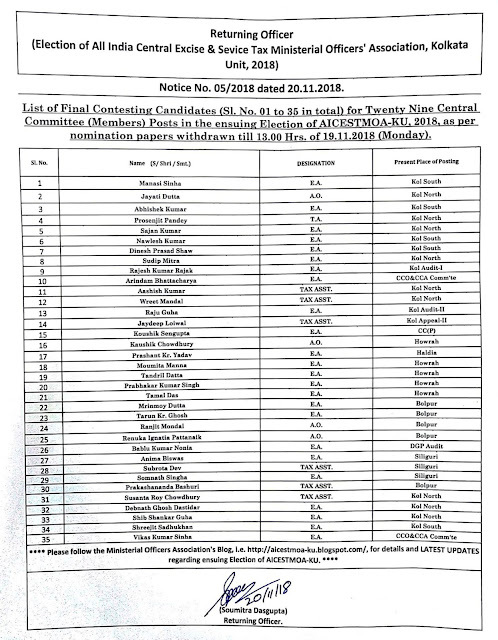 NOTICE NO.03/2018 DATED 15.11.2018 ISSUED BY RETURNING OFFICER PUBLISHING THE FINAL VOTER LIST OF MEMBERS FOR AICESTMOA-KU ELECTION - 2018 TO BE HELD ON 27.11.2018, TUESDAY (CLICK HERE TO VIEW THE VOTER LIST). AICESTMOA-KU. Travel theme. Powered by Blogger.